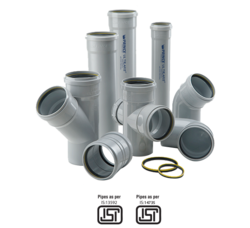 SWR pipes and fittings are used for soil, waste and rain water management. These pipes are immune to bacteria, fungi, micro-organisms, rodent and insect attack. The pipes conform to IS: 13592, while the fittings are manufactured as per IS: 14735. Ajay Drainline is the most advanced PVC SWR piping system available in India today. It has a complete range of for soil, waste and rainwater plumbing system. Ajay incorporates the use of DM-seal jointing system specially designed for easy, leak-proof and cost-effective installation. The system offers various installations options, superior quality finish, and unparalleled dimensional accuracy. 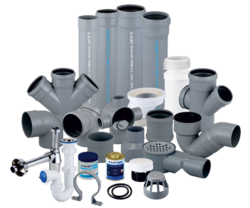 Looking for PVC - SWR Pipes & fittings ?